Jay Thompson is a former brokerage owner who spent the past six years working for Zillow Group. He retired in August 2018 but can’t seem to leave the real estate industry behind. His weekly Inman column publishes every Wednesday. Today I was chatting with a new-ish real estate agent about holding open houses. We talked about the marketing, signage, setting seller expectations, etc. Then I mentioned having a sign-in sheet and bringing a “partner” — a fellow agent, a lender, someone — primarily for safety reasons. Let’s see. You’re letting complete strangers into a home. Quite possibly you are the only other person there. They come inside the house, you shut the door, and now you’re alone in a house with someone you have known for 10 seconds. You don’t know them, their past, their name, nothing. You‘re alone, behind closed doors, with a stranger. Think people. Think. You have to think about safety — all the time. Jay Thompson’s Facebook status update, March 26 at 12:20 p.m.
Fifty-plus comments and over 200 “likes” within a day says something loud and clear: This is a topic many are passionate about. Seems it might be worth a deeper look. Agent safety has been an issue in this industry since day 1. After all, real estate sales is inherently dangerous. There aren’t many professions where practitioners regularly meet with complete strangers — alone. Let’s flesh out my little Facebook story. This particular conversation was held with a female. Commenters on my post were quick — and completely correct — to point out that while the female agent takes the brunt of safety-related incidents in real estate, their male counterparts are certainly not immune. Men tend to think it can’t happen to them, but nothing could be further from the truth. Sadly, there have been plenty of safety cases involving male agents. Steven Bernard Wilson was shot while in a model home. A few days later, an 18-year-old was arrested. He allegedly stole Wilson’s phone and laptop. Realtor Orlando Martinez was found dead in his car, shot in the head while parked in front of his listing, on Nov. 1, 2018. His killer remains at large. Sid Cranston, Jr. was murdered in 2015 while looking at investment property. That’s three dead males, and sadly there are more cases out there involving men. Agent safety is not just a “female problem.” It is an agent problem. That makes it a broker problem as well. Never, ever, hold an open house alone. Take a fellow agent. Find a lender who will sit an open house with you. It shouldn’t be hard, lenders should love open houses — they can sit there and qualify people for loans all day long. Require all visitors to sign in and leave nothing less than a valid name and email address (address and phone would be good to add). Yes, the bad people can fake a name and contact info (as can the good), but at least it’s something — and it might send away anyone with nefarious intent. Notify someone — a person in your office, an answering service, a friend or a relative — that you will be calling in every hour on the hour, and if you don’t call, they should call you. Never lead a visitor into a room. Let them lead. You should stay between them and the door so you can make a quick exit if necessary. When entering a property for the first time, mentally plan potential escape routes, and unlock deadbolts to allow for a swift exit. If you plan to exit into a backyard, make sure you can get out of the yard. Fences, pools and landscaping often make it hard to exit an enclosed yard. Make sure your cell phone is charged. Bring a spare battery or cord just in case. Avoid attics and basements. Never walk into small areas, like closets, bathrooms, etc., with no means of escape. 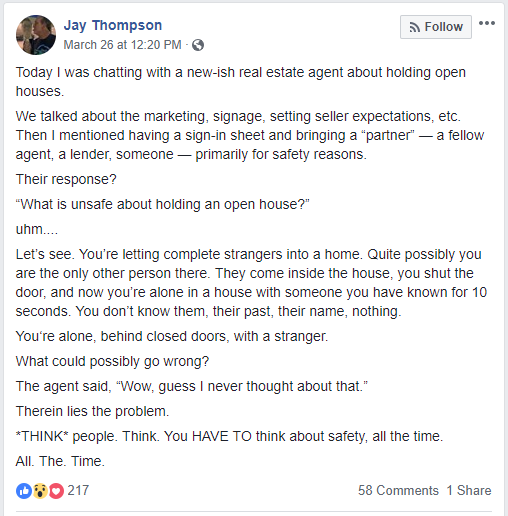 Every item noted in the section above about open house safety applies to showing listings as well. Some might need to be adjusted for showing versus holding an open. First-time meetings should be held in a public place, not a vacant home. And you probably won’t require a buyer to “sign in” — but please have at least a name and email address before you show homes, and ask to see a valid ID. Worried if you do that you might lose the buyer? Well, it sure beats losing your life, doesn’t it? There will be other opportunities. You only have one life. Ponder this: You have to show ID to test drive a car. You show your ID to check into a hotel. Why in the world would you not require someone to show ID to view homes? And seriously, if a buyer doesn’t care enough about you to show you ID, do you really want them as a client? Brokers, your policy and procedure manual should require agent safety training, awareness, the checking of IDs and first meetings in public. No exceptions. No discussion on agent safety would be complete without at least mentioning arming yourself in some fashion. Whether or not to carry a firearm is a very personal decision. If you decide to go that route, you need to commit to training and practicing with your firearm. There’s a reason law enforcement trains constantly. Shooting paper targets in the controlled environment of a range is very different from drawing a gun, pointing it and being prepared to shoot someone. Without training, and a lot of it, you have no idea how you’d react in a safety situation. The last thing you need then is someone disarming you and using your weapon against you. Understand the carry laws in your state, understand your weapon and practice constantly. Same goes with knives, mace, pepper spray, a baseball bat or anything that has been weaponized. You have got to know how to handle it under extreme duress. There are agent-specific safety training classes available. There is general safety training available. Contact your local Realtor association, your local police department (non-emergency number) or the Beverly Carter Foundation for more info. You might also consider investing in yourself, and your life, by taking some self-defense courses. There are a wide variety of available options. Krav maga and jiu-jitsu are two popular martial art styles for self-defense. Yes, men need to take classes too. You’re not as rough and tough as you might think, and you’re certainly not faster than the muzzle velocity of a bullet. Check your ego at the door, and take some safety training. In short, it’s paying attention to what is going on around you, avoiding places or scenes where trouble may lie and generally being cognizant of your surroundings. There is a terrific article on situational awareness here. It’s lengthy but well worth the time investment. Reread it from time to time to refresh yourself. Ladies, do not be dissuaded by the “Art of Manliness” site location of this article. Read it. Understand it. It could save your life or get you out of a potential life-altering event before it even happens. Any law enforcement officer or safety expert who knows what they’re doing will tell you it’s always easier to prevent an issue from developing than it is to take matters into your own hands. There are legitimate concerns over agent safety. By the very nature of their jobs, agents — male and female alike — put themselves at risk. You don’t need to be paranoid and quake in fear every time you show a home or hold an open, but you do need to practice situational awareness, take some safety classes, consider self-defense classes, and if you choose to arm yourself, take classes and repeated training so you know how to properly react in a crisis. Jay Thompson is a real estate veteran and retiree in Seattle, as well as the mastermind behind Now Pondering. Follow him on Facebook or Instagram. He holds an active Arizona broker’s license with eXp Realty.